Like most little boys and girls, MJ loves watching shows and playing games on his tablet screen. One special day, however, he wakes up having undergone a magical transformation. He can’t wait to show everyone. But going through his new day with his changed features is much harder than it seems. MJ has several important realizations that will help children (and their parents) manage screen time in the digital age. 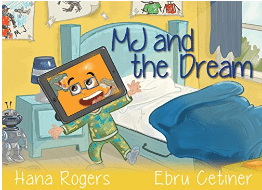 In the tradition of Everyday Wishes, the first title in the MJ and friends series, this wonderfully illustrated picture book will soon become a favorite.